The Nutcracker and the Four Realms bonus features are as spectacular as the stunning imagery the film itself provides. Disney’s The Nutcracker is now available on Blu-Ray, digital and Movies Anywhere. Read my Disney Nutcracker review to see if the film is a good fit for your family. Destined to become an annual viewing tradition for adventurers of all ages, the film includes never-before-seen extras and deleted scenes on Digital and Movies Anywhere. Disney’s dazzling adventure “The Nutcracker and the Four Realms” — inspired by E.T.A. 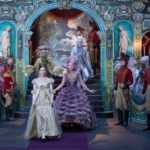 Hoffmann’s classic tale and the beloved ballet “The Nutcracker” — carried audiences along with 14-year-old Clara (Mackenzie Foy) to a magical, mysterious world with breathtaking performances by Misty Copeland plus sweets, snowflakes, soldiers, scurrying mice … and no shortage of surprises. On Pointe: A Conversation with Misty Copeland – Copeland shares the thrill of portraying one of her favorite characters in a whole new way. I fell in love with Misty Copeland after our exclusive interview. She is extremely talented and has a huge heart. Watch Disney’s The Nutcracker and the Four Realms on Digital, Movies Anywhere and Blu-ray is available now! For more Disney Nutcracker news follow on Twitter and Facebook! Enjoy these Disney Nutcracker Coloring Pages to continue the family fun!